Did more people see #thedress as blue and black or white and gold? How many Twitter users wanted pop star Katy Perry to take the #icebucketchallenge? The power to explore online social media movements—from the pop cultural to the political—with the same algorithmic sophistication as top experts in the field is now available to journalists, researchers and members of the public from a free, user-friendly online software suite released today by scientists at Indiana University. 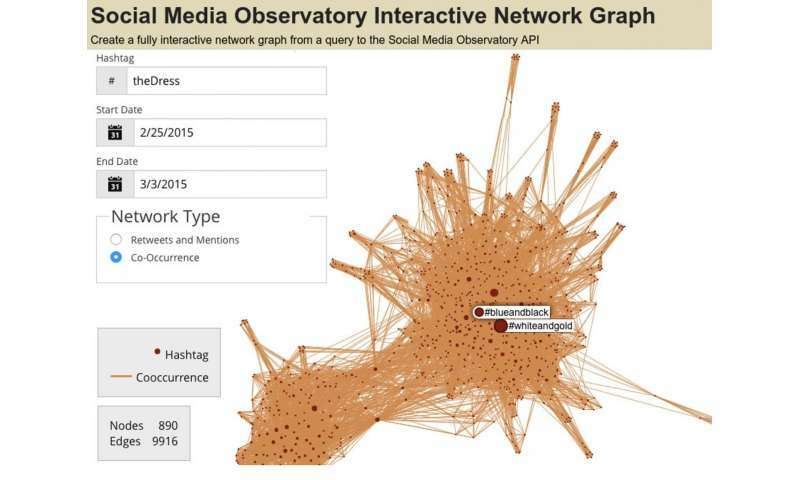 The Web-based tools, called the Observatory on Social Media, or "OSoMe" (pronounced "awesome"), provide anyone with an Internet connection the power to analyze online trends, memes and other online bursts of viral activity. An academic pre-print paper on the tools is available in the open-access journal PeerJ. "This software and data mark a major goal in our work on Internet memes and trends over the past six years," said Filippo Menczer, director of the Center for Complex Networks and Systems Research and a professor in the IU School of Informatics and Computing. The project is supported by nearly $1 million from the National Science Foundation. "We are beginning to learn how information spreads in social networks, what causes a meme to go viral and what factors affect the long-term survival of misinformation online," Menczer added. "The observatory provides an easy way to access these insights from a large, multi-year dataset." Trends, which shows how memes rise and fall in popularity. 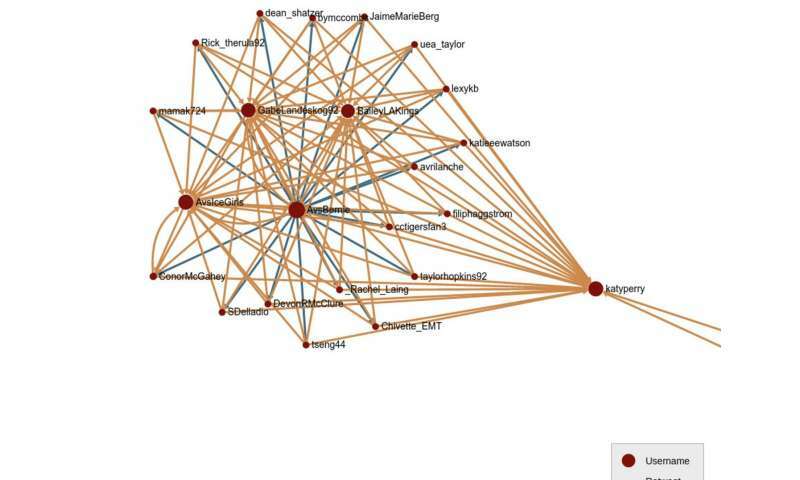 Networks, which creates interactive graphs showing who is tweeting a meme and how they're connected. Movies, which generates animations on YouTube showing how memes spread and evolve over time. Maps, which creates a map pinpointing where in the world people are discussing a meme. By plugging #thedress into the system, for example, OSoMe will generate an interactive graph showing connections between both the hashtag and the Twitter users who participated in the debate over a dress whose color—white and gold or blue and black—was strangely ambiguous. The results show more people tagged #whiteandgold compared to #blueandblack. For the Ice Bucket Challenge, another widespread viral phenomenon—in which people doused themselves in cold water to raise awareness about ALS—the software generates an interactive graph showing how many people tweeted #icebucketchallenge at specific Twitter users, including celebrities. One example illustrates a co-occurrence network, in which a single hashtag comprises a "node" with lines showing connections to other related hashtags. The larger the node, the more popular the hashtag. The other example illustrates a diffusion network, in which Twitter users show up as points on a graph, and retweets or mentions show up as connecting lines. The larger a cluster of people tweeting a meme—or the more lines showing retweets and mentions—the more viral the topic. OSoMe's social media tools are supported by a growing collection of 70 billion public tweets. The long-term infrastructure to store and maintain the data is provided by the IU Network Science Institute and High Performance Computing group at IU. The system does not provide direct access to the content of these tweets. The group that manages the infrastructure to store this data is led by Geoffrey Fox, Distinguished Professor in the School of Informatics and Computing. The group whose software analyzes the data is led by Judy Qiu, an associate professor in the school. "The collective production, consumption and diffusion of information on social media reveals a significant portion of human social life—and is increasingly regarded as a way to 'sense' social trends," Qiu said. "For the first time, the ability to explore 'big social data' is open not just to individuals with programming skills but everyone as easy-to-use visual tools." In addition to pop culture trends, Menczer said, OSoMe provides insight to many other subjects, including social movements or politics, as the online spread of information plays an increasingly important role in modern communication. The IU researchers who created OSoMe also launched another tool, BotOrNot, in 2014. BotOrNot predicts the likelihood that a Twitter account is operated by a human or a "social bot." Bots are online bits of code used to create the impression that a real person is tweeting about a given topic, such as a product or a person. The OSoMe project also provides an application program interface, or API, to help other researchers expand upon the tools, or create "mash-ups" that combine its powers with other software or data sources.